When we share a story with a friend, we tend to exaggerate. Overextend some facts, fudge the truth a bit, all in hopes of making our tale more exciting. Then there’s always that story that you don’t exaggerate at all because as crazy and wild as it is, it’s all true. That’s Colin Summers’ Steve: A Docu-Musical. It’s so crazy, you know it’s authentic! In Steve: A Docu-Musical, Summers tells his tale of struggling artist who begins a cyber relationship with a man that will forever change his life. Summers started a website that allowed consumers to send their poems and he and his writing partner, Andrew, would set their words to music and a song would be born. For a price. When business was struggling, an Australian benefactor, simply named Steve, e-mails Colin and the story begins. 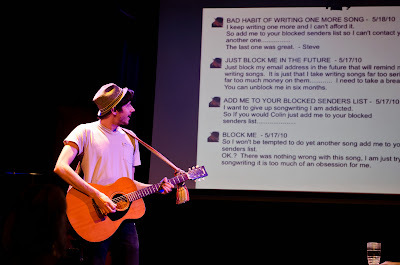 Summers recounts the endless amount of correspondence exchanged between he and Steve while sharing the songs the duo created, filled with Steve’s hear-it-to-believe-it lyrics. All in fun, Summers discovers that this man, nearly double his age, has touched him in a way that will change him for the better. Colin Summers' Steve story is fun and entertaining. Summers has a loveable presence because he’s just as excited to tell his tale as the audience is to hear it. Though in his moments of story telling he occasionally seemed lost like a deer in headlights, the moments with his instruments he felt most comfortable and confident. Summers nonchalant persona verged on monotone, but that’s who he and works for this story. Summers’ songs were fun and hummable in the theater, but you probably won’t be walking out remembering any. But you should probably go search them out after the show. Luckily the program includes a link so you can find them. Director Nessa Norich did a nice job aiding Summers. There was a nice balance between monologue to projection to instrument swap, and finding when was appropriate to hear Summers read Steve’s e-mail and when we should take it in ourselves. Those key moments earned laughs in all the right ways. The final image of Summers silhouette against the white projection screen while Steve himself was singing via recording was the moment of the show.